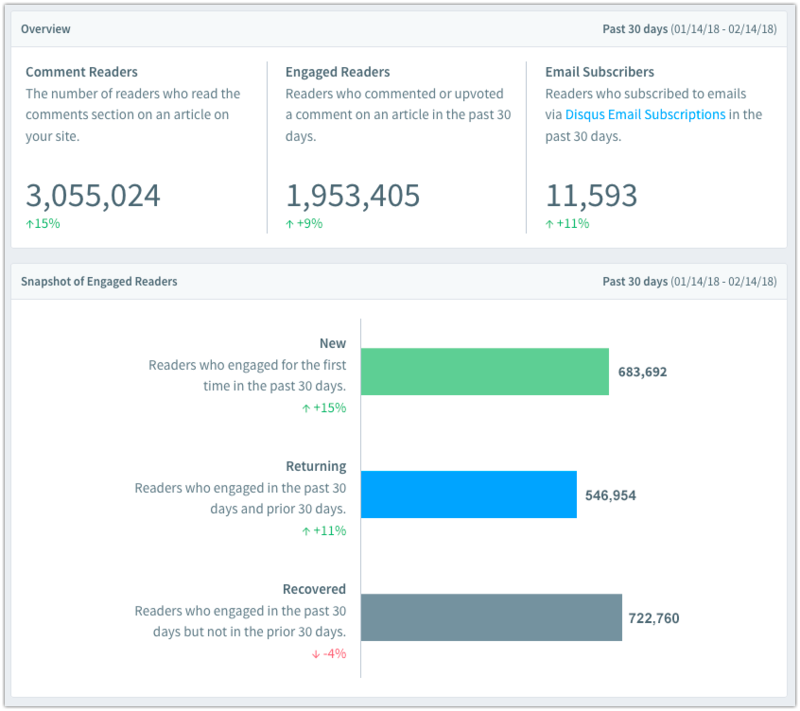 The analytics dashboard features top-line metrics and content analysis that help publishers better understand audience engagement occurring directly on their site. This analytics suite is designed to provide actionable insights for the unique engagement you’re capturing through Disqus. To visit the advanced analytics dashboard, go to the Disqus admin > Analytics. **Access to Pro Analytics is currently available with a Pro subscription. If you would like to subscribe to Pro, you can do so in your Subscription & Billing. For information about our basic community metrics page, which will remain available to all sites, see Engage and Reveal Metrics. Track these top-line metrics over time to easily identify how your site is performing with your audience. Month-over-month change indicators will display in green and red so that you can quickly gauge the health of your engagement metrics, especially as your community grows over time. Article reads: The number of times people view an article where Disqus is installed. Comment reads: The number of times people view the comment section on an article. Overview: A multi-axis graph of Article Reads, Embed Reads, Engagements over time so that you can easily track the positive relationship between Disqus engagement and your readership. Use the Traffic Overview graph to dig into top-line metrics for specific days or to zoom out for spotting larger trends. Click on specific metrics to toggle their visibility in the graph to adjust your focus when tracking trends over time. Content Analysis provides a summary of your most recent site content, ranked by total engagement. The insights generated on this page are designed to inform your unique content strategy as a publisher so that you can optimize for attracting and retaining loyal readers. Total Engagements: Total number of comments and votes for a given article. Comments: Total comments for a given article. Commenters: Total unique commenters for a given article. Click on any of the engagement column headers to sort the data, or use the date picker to narrow your view to a specific date range. The Audience Analytics provide insights into your readers’ engagement behavior and informs the actions you can take to further optimize your community. Use the Overview to understand how your community is growing and to measure the overall impact of your current engagement strategy. Subscribers: total users who have opted in to your email list via the Email Subscriptions feature. Drill down further for a breakdown of total New, Returning, and Recovered users to see how each segment is represented in your community and their respective rate of growth. Use the Community Members table to view a profile of each user, including their total engagements (comments + votes), the date of their first and most recent engagements, and their engagement status. To sort any of these columns using a column header to identify interesting segments of your community, for example "recently acquired users" or "most active commenters". Click Export CSV to receive a CSV email attachment. Downloading the data from Disqus can be useful for performing a deeper analysis, especially if you want to combine Disqus user attributes with other audeince data that you have. How far back can I look up metrics in Audience Analytics? Data is available as far as a year ago so you can find metrics up to January 2017. I did not receive the Exported CSV email, what should I do? While you are logged in, go to your account settings to make sure your email address is correct. Note that the time it takes to receive the email may vary based on the size of your audience. Contact Support if you still have trouble receiving the email.